President George Bush, who had previously been with the CIA, was the first president to meet with the Dalai Lama. The Dalai Lama wrote a letter to President Clinton expressing his desire for independence for Tibet. Although he promised "Change we can believe in," Presiden Obama continuse the policy of the Bush-Clinton-Bush era. China, and Chinese have expressed their strongest disapproval of this meeting, and the US's continued interferrence in their domestic affairs. China also stated that this meeting has hurt the Chinese, and they would respond acordingly. Within hours of the meeting China summoned the US Ambassador and lodged their complaint. This meeting comes on the heels of the announcement that the US would sell over $ 6 billion worth of arms to Taiwan. What is the official policy of the US to China, and is there secret policy? "Your Holiness will understand, of course, that the readiness of the United States to render you the assistance and support outlined above is conditioned upon your departure from Tibet, upon your public disavoual of agreements concluded under duress between the representatives of Tibet and those of the Chinese Communists, and upon your continued willingness to cooperate in opposing communist agression. An essential part of our cooperation would be a public announcement by the United States that it supports the position of Your Holiness as the head of an autonomous Tibet. The United States would also support your return to Tibet at the earliest practical moment as head of an autonomous [ , ] and non communist country. The position of the United States in this regard is fundamental and will not be affected by developments in Korea or by Chinese Communist...."
As you can see, the exerpt above shows that the US has supported the Dalai Lama's activities re China's Tibet since 1951. The offer was put into writing at the insistance of the Dalai Lama's elder brother, who was already a paid CIA asset. The agreement mentiond in the letter is the 17 point agreement, which certainly was not the result of duress, but must have alarmed the US, who had refused to recognise the PRC after Chaing Kai Shek lost the Chinese Civil War and fled to Taiwan. At that time McCarthyism was rampent in the US, and Eisenhower woried about the so called "Falling Dominoes" theory that "the communists wanted to take over the world," and countries would "fall" to communism, one after another, like falling dominoes. However, the Dalai Lama did not take up the US on it's "offer" until 1959. Why? The Chinese arrived in Lahsa, peacefully, under the provisions of the 17 Point Agreement, yet today some still falsly accust the Chinese of "invading" Tibet! Why? 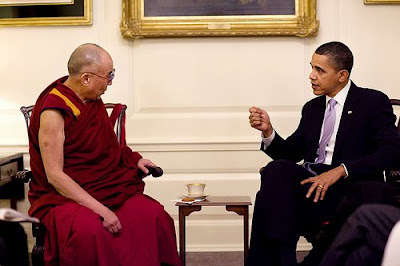 What was really going on, what was really the relationship between the Dalai Lama and the US? The Dalai Lama finally left Tibet in March 1959, two weeks lated China emancipated the over 6000 serfs and 106 house slaves of the Dalai Lama along with all the serfs and slaves in Tibet. Why didn't the Dalai Lama not emancipate his serfs and slaves himself? Why did he not keep faith with the 17 Point Agreement?